If you are a long time reader, you know that I have a warm spot in my heart for Sunday dinners. They are something that I sometimes plan all week for and that we all really look forward too. But what I don't write that much about is our Sunday breakfast menu. I like to start the day off with a big meal to fill our bellies and then spend the rest of the day playing, doing chores, and being lazy (yeah right) until 5 o'clock "apps" time rolls around. We enjoy the usual suspects like pancakes, waffles, and french toast. 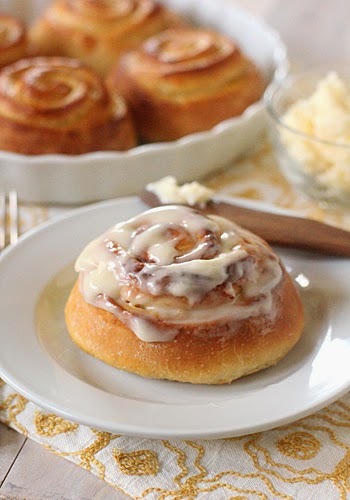 But one of our favorites is soft scrambled eggs with chives, fresh fruit, and some kind of sweet baked good, like coffee cake, muffins, or in this case...orange sweet rolls with cream cheese icing. 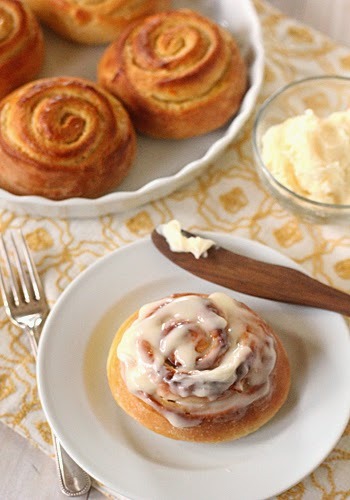 If you are a fan of big, buttery cinnamon rolls slathered with cream cheese icing and love the flavor of orange marmalade, then..."say hello to my little friend." In fact, my husband actually prefers these over cinnamon rolls. These are simply an enriched white bread dough that I enrich even further buy adding an egg and some potato flour to keep the dough soft and tender. The filling is just orange marmalade with a bit of ground ginger. Some orange marmalades can be on the bitter side, so I mix in a little light brown sugar to counteract that (and it adds to the gooey, sticky goodness-- nothing wrong with that). You can certainly make these the morning of, but who really wants to wake up three hours before breakfast is served?? I can think of better things to do than drink coffee while watching the chemical reaction of yeast. And that would be sleeping in for this gal! So to make sure I get a full night's worth of beauty sleep☺, I make the rolls the night before and let them "cold rise" in the refrigerator overnight. While the oven is preheating the next morning, I take the rolls out and let them come to room temperature. Meanwhile, I can get all the other components for breakfast ready. In the bowl of a stand mixer fitted with the dough hook, combine the flour, dry non-fat milk, potato flour, yeast, sugar, salt, egg, zest, butter and water. Mix on low speed until combined. Increase the speed to medium and knead until the dough is smooth and just sticking to the bottom of the bowl, about 5-7 minutes. Turn the dough out onto a lightly floured work surface and shape into a ball. Spray the inside of the mixing bowl with non-stick spray and place the dough inside the bowl. Cover with a sheet of plastic wrap and let rise in a warm, draft-free space until it has doubled in size, about 1 hour. Meanwhile, in a large bowl using a hand-held mixer, beat together the cream cheese and butter until smooth. On low speed, gradually add the confectioners' sugar until combined. Stir in the vanilla. Spread the cream cheese icing over the warm rolls. Enjoy! I love these rolls!! So yummy looking. Nicole - These look beautiful! 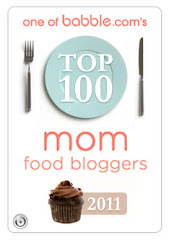 I'm thinking a version with raspberry preserves would be good too! When you do the "cold rise" the night before, do you let them sit at room temperature at all 1st or do you just put the pan straight into the fridge? Also, do you prefer active dry yeast to instant? Thank you, Carolyn! I do not let the rolls rise at all. I just cut them, place them on the baking sheet, wrap them in plastic wrap, and place them in the refrigerator. I've noticed that most of your bread recipes call for active dry yeast. Do you prefer that over instant dry yeast? Yes, I buy active dry yeast in bulk. You can use instant dry yeast, but the rising time will be slightly less. I usually buy IDY in bulk, but accidentally bought a big pack of ADY... dough seems to rise super fast in my kitchen (wild yeast in the air?) so it actually may work in my favor to slow down my rise times. I'm going to give it a go.